Sermon for the Nativity of St. John the Baptist: "Christmas in June"
As readers enter the wardrobe into C.S. Lewis’s magical world of Narnia, we hear those haunting, sorrowful words: it was always winter and never Christmas. Now, here in Southern California it might feel like it’s always summer and never winter. Nevertheless, it’s beginning to look and sound a lot like Advent and Christmas. Today it’s 6 months till Christmas Eve. How’s that Christmas list coming along? Today the prophet Isaiah’s words are fulfilled in our hearing, and in the eating and drinking of God’s comfort in his Word and in Jesus’ body and blood. And if every Sunday is a little Easter, a weekly celebration of Christ’s death and resurrection for us, then every Sunday is also a little Christmas, even in June. Today we rejoice that our Lord prepares us for his coming and continues to visit us and redeem us. We join Elizabeth in receiving great mercy from our Lord. We join the crowds in listening to John’s preaching. For this reason, the Lord sent John. John is that voice, a human gramophone playing broken record filled with God’s Word of repentance and forgiveness of sins in Jesus. John is the moon, not the sun. There was a man sent from God, whose name was John. He came as a witness, to bear witness about the light, that all might believe through him. He was not the light, but came to bear witness about the light. John is the messenger, but what really matters is the message he proclaims: Behold, the Lamb of God who takes away the sin of the world. As John said of himself, let it be true among us as well. I must decrease; and Christ crucified must increase. Because as important as John’s work for Jesus was and still is, Jesus’ work for John and us is even more important. After all, that is why John is sent. We still need John’s voice. For this wilderness is not a quiet place. Like turning your iTunes or Spotify account on shuffle, there is an endless cacophony of voices competing for your attention. The devil’s voice rages as well, offering false promises, false hopes, and false comfort. And then there are the more familiar voices. That relentless voice from within that pounds our ears with our own shame, sorrow, sin, guilt, pride, pain, failures, fears, disease, doubt, despair, and death. Into this wilderness of noise, the Lord sends us his voice John. Thankfully, God speaks another word through the voice of John. John is also a prophet of Good News, God’s grace. That’s what John’s name means: God is gracious. A fitting name for a preacher of consolation, comfort, and Christ Crucified for you. John is sent to give knowledge of salvation to us in the forgiveness of our sins, through tender mercy of our God. This comforting, consoling word of the Lord filled Zechariah with joy. The Lord opened his lips, loosed his tongue, and his mouth declared the Lord’s praise. As Zechariah sings, the volume of God’s gracious salvation is turned up to 11, full blast, blow-out-the-speakers Good News. Every word of his song blares comfort that rings Jesus’ salvation into our ears. God speaks and delivers his word to us in water, word, bread and wine. At this altar our Lord visits and redeems us. In this church and school, the Lord speaks salvation to us as he spoke through the holy prophets of old. Here the Lord quells all the voices of our enemies and drowns them out with his mercy, salvation, and promise. There’s a marvelous picture of the church in John the Baptist. Our new birth in Holy Baptism, like John’s birth, is by God’s grace. From Elizabeth’s barren and aged womb, the Lord brought forth life. From the barrenness of sin and death, our Lord brings forth new life in us in Holy Baptism. We’re like John, called to live in the wilderness of this fallen world. An unrelenting, arid wasteland of sin and sorrow, grief and pain, disorder, decay and death. We stick out like John too. We may not wear camels-hair clothing or eat locusts and wild honey. But John’s message of repentance and forgiveness in Jesus are just as unpopular today as it was in his day. Yet, we are not alone, just as John was not alone. Our Lord comes to us as he did to John in the wilderness to silence the devil’s temptations, to irrigate the deserts of our hearts with living water, and to deliver us from the hand of our enemies. And like John, we’re sent out as a voice in the wilderness. As pastor and people, we have different vocations and responsibilities, but our message is the same as John’s: Behold the Lamb of God who takes away the sin of the world. By God’s grace this is what Redeemer has done, and will continue to do: in Redeemer’s preschool where a flock of little lambs sings the praises of the Lamb of God, and learns the love of their Good Shepherd; in Redeemer’s VBS, youth, and Sunday School as we train the children up in the ways of our Lord, giving them a faith to grow into, not out of; in Redeemer’s symphony of musicians, choirs, and musical talent where you sing the praises of him who called you out of darkness into his marvelous light. The same Holy Spirit who sent John into the wilderness to be a voice of comfort also fills our hearts, minds, and voices with the comfort of Jesus crucified; and we’re sent into the wilderness to point our family, friends, neighbors, coworkers, teachers, barbers, doctors, mechanics, and anyone else we know to the Lamb of God who takes away the sin of the world. Sermon for Feast of St. Barnabas: "Sons of Encouragement"
Set apart. That’s the work of the Holy Spirit. The Holy Spirit calls, gathers, enlightens, and sanctifies –gives the Lord’s holiness to his people, consecrates, and sets apart – the whole Christian church on earth and keeps her with Jesus Christ in the one true faith. Barnabas was not the first to be set apart by the Holy Spirit for the work of the Gospel. The Lord set apart Noah and called him to build an ark. The Lord set apart Abraham and called him the father of many nations, for by the Seed of Abraham, all nations on earth would be blessed. The Lord set apart Moses and later Joshua to lead his people out of slavery in the exodus, through the wilderness, and into the promised land. The Lord set apart David to be his anointed king and promised him that one of his descendants would make his throne an everlasting throne and give us an eternal kingdom. The Lord set apart the Old Testament people of Israel to be the family tree that would bring about the birth of Jesus. The Holy Spirit sets us apart too. And just like Barnabas, our Lord’s holiness, his calling us, our being set apart is gift. To be holy isn’t like being bit by a radioactive spider and wake up in the morning with super-holy powers; it’s not like a caffeine buzz or a Red Bull energy boost; and it’s not likee that feeling of being twitterpated that Thumper tells Bambi about in the springtime. No, for Barnabas, you, me, and all Christians, God’s holiness isn’t something you achieve, but his gift you receive. Think of it like a noun that our Lord declares about you – you are holy in Him who is holy - not a verb you do to be holy. Father, Son, and Holy Spirit sets us apart by water and word in Holy Baptism. We are set apart as God’s children through baptism into Christ. We are set apart from sin and death by baptism into Jesus’ death and resurrection. We are set apart by the Holy Spirit to be God’s holy, chosen people, his beloved, treasured possession. Called by the Gospel. Enlightened with his gifts of water, word, bread and wine. Sanctified and kept in the one true faith, just as St. Barnabas was…by grace through faith in Christ. You are holy in Jesus. You are set apart in Jesus. Barnabas was too. We first meet Barnabas in Acts 4, where Luke tells us that he sold a field that belonged to him and brought the proceeds to the feet of the apostles for the work of the Gospel. 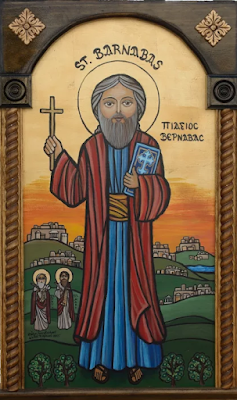 Barnabas had heard Jesus’ call to take up his cross and follow him, by grace in the same Lord Jesus Christ, who though he was rich, yet for your sake he became poor, so that you by his poverty might become rich. After Paul’s conversion to Christianity, it was Barnabas who took Paul under his wing, introducing him to the apostles and assuring them that Paul no longer persecuted the Church, but proclaimed Christ Crucified. Barnabas also joined Paul on his first missionary journey. There at the church in Antioch, Barnabas was ordained by the laying on of hands for a simple, yet important purpose. Set apart for me Barnabas and Saul for the work to which I have called them. The work preaching God’s Word of good news to all nations. The work forgiving sin in the stead and by the command of the Lord Jesus Christ. The work of teaching and baptizing in the name of the Father, Son, and Holy Spirit. The work of being a steward of the mysteries of God, faithfully administering the sacraments. His name says it all. Barnabas means “son of encouragement.” And if that word sounds familiar, there’s a good reason for it. It’s the same Greek word for comfort, consolation, and helper. It’s similar to the word Jesus uses when he promises to send the Holy Spirit, the comforter. Coincidence? No. As Paul wrote in 2 Corinthians (1:3ff) Blessed be the God and Father of our Lord Jesus Christ, the Father of mercies and God of all comfort, who comforts us in all our affliction, so that we may be able to comfort those who are in any affliction, with the comfort with which we ourselves are comforted by God. This is the work Barnabas was set apart to do, wherever the Lord called him. But of course, St. Barnabas’ feast day isn’t really about St. Barnabas is it? It’s about God the Father who sent his only Son who gave up all he had - not a field, gold or silver, but his holy precious blood, and his innocent suffering and death…that Barnabas, and you, and me, and all people, would be his own. It’s about Jesus who was set apart for you. Born for you and called the Holy Child, the Holy One of Israel. Jesus is God and man to deliver us from everything we think, say, and do that is unholy. Jesus is holy for you. He is called and set apart in His perfect life, lived for you, and His perfect death on the cross where He died for you. Jesus was set apart and called by God to accomplish salvation for Barnabas and for you. Jesus our greater Noah by whom we are set apart in his holy ark of the Christian Church. Jesus the Offspring of Abraham who is our brother, Lord and Savior, who set’s us apart to be God’s own children. Jesus, David’s son and David’s Lord who reigns as king from his manger to his cross, and from his resurrection to his heavenly throne. It’s about the Holy Spirit who set apart Barnabas for the work he was called to do, which means today is also about how the same Holy Spirit calls and sets you apart too. Through Jesus’ dying and rising you are also set apart and called. In Baptism you are set apart from your sin, and you are holy. In your Baptism you are set apart by God for His calling: your calling to faith in Jesus, and to love your neighbor. Your vocation may be entirely different from Barnabas’, but like Barnabas, you are set apart to receive the Lord’s treasures: His Word, water, Body and Blood, and called to speak that Good News to anyone who asks you for a “reason for the hope that is within you” (1 Peter 3:15). As a congregation you are set apart as well. The work that our Lord called Barnabas to do, he calls Redeemer to as well. The faithful preaching and teaching of God’s Word to you his people, and to this community. The work of calling and ordaining pastors who forgive sin in the stead and by the command of Jesus. The work of teaching and baptizing in the Name of the Father, Son, and Holy Spirit. The work of being rightly handling the word of truth and faithfully administering the sacraments as our Lord taught and gave you. The work of being a Barnabas, a son of encouragement in all you say and do, in your callings in life here at Redeemer, and in your callings in life at home, work, and society. It is my heartfelt prayer and encouragement to you all that you remain faithful in these things, even as our Lord kept Barnabas in the one true faith. Today, we thank God for St. Barnabas, the “son of encouragement,” who brought the encouragement of Christ wherever he went, who lifted up the weak and the wavering, who comforted the distressed and brought calm to controversy. And we thank God for the Barnabas’ in our congregations today, who encourage the discouraged and bind our wounds, that the good news of Jesus may be preached even more. Sermon for Trinity Sunday: "Born from Above"
Whether it’s the birth of your own child, grandchild, or that of family or friends, or your own, there’s something special about one’s birthday. True enough, as we grow older we may be less excited about our birthdays than we were when we were younger; we may move from counting how many presents we received to counting the innumerable blessing the past year has brought. Either way, a birthday is a time of excitement, joy, and above all, life. Birth and new life is the topic of discussion between Nicodemus and Jesus here in John 3. Notice how John says Nicodemus came to Jesus “By night.” That’s more than a time stamp. It’s a theological statement. Nicodemus was probably afraid, ashamed, and apprehensive. He was in the dark physically and spiritually, the darkness of unbelief and sin. But at least he came to the right source: to the one who is Light of Light, very God of very of God. Nicodemus also didn’t come to Jesus for a confrontation. He wasn’t like the other Pharisees, always looking for an angle on Jesus, trying to trap him in his words or hit him with a gotcha question. Nicodemus came to Jesus like a thirsty man in the desert, like a blind man in search of sight. We’re like Nicodemus you see. We come to Jesus by night too. Afraid. Ashamed. Apprehensive. We try and hide our shame, fear, and guilt. We try and bury our burdens in the dark in hopes of staying invisible, of hiding from God and others. But we can no more hide from our Lord than Adam and Eve could. But here’s the shocking, amazing thing. God did not send his Son into the world to condemn the world, but that the world would be saved through Him. Jesus found Nicodemus that night, and he finds you. Jesus the Light of the world enters the darkness for us. Nighttime and darkness may be full of bad things, but it’s also when God works his greatest for us. YHWH rescuing Israel in the Exodus by night. Jesus’ birth announced to the shepherds watching their fields by night. The Lord’s Supper given on the night in which Jesus was betrayed. Jesus came to bring Nicodemus, us, and the whole world from dark to light, from death to life, and from our old birth from below in Adam, to a new birth from above in Jesus and the gift of word, water and spirit in your Baptism. Maybe you’ve heard that phrase before. “I was born again.” Or, “have you been born again?” I always like to answer, yes. I was born again in Holy Baptism when I was about 2 weeks old. “Born from above” – that’s what the phrase can also mean, and that’s what Jesus is telling us along with Nicodemus. Unless one is born from above he cannot see the kingdom of God. In John 1, we’re told the same thing. Jesus came to his own, and his own people did not receive him. But to all who did receive him, who believed in his name, he gave the right to become children of God, who were born, not of blood nor of the will of the flesh nor of the will of man, but of God. Safe to say, we’d probably agree with Nicodemus if we were in on this conversation that night too. It all sounds rather odd, doesn’t it? We have two births according to Jesus. Our first birth is usually in a hospital, where we receive life from our parents. Breathing, growing, muscular movements and all that life entails. Our second birth is in the baptismal font, where we receive life in the Name of the Father and of the Son and of the Holy Spirit. Mercy, love, and receiving God’s gifts and all that life in Christ entails. Our first birth is from below, from Adam and it’s a birth that leads to death. That which is born of the flesh is flesh. Our second birth is from above, from Christ the second Adam in whom we live; it’s a birth in which we die and rise again in Jesus. In Christ in Baptism you are a new creation. In Christ in Baptism you are born from above. That which is born of the Spirit is spirit. Behold what manner of love the Father has given unto us, that we should be called the children of God. And so we are. We had no more to do with our birth from above in Holy Baptism than we did our first birth from our parents. Both are God’s free gift of life. We join Nicodemus in wondering, How can these things be? Jesus is the center, the One on whom the spotlight is focused. No one has ever seen God, John says, but the only-begotten God, the Word Incarnate, the second Person of the undivided Holy Trinity, He has made God known. If we want to know and see God, we look to the God who came to us as the Son of the Virgin and the Man of the Cross. This is God in terms we can comprehend, who embraces us, who is born and suffers and dies, who is bone of our bones and flesh of our flesh. The Father sends the Son to die and rise who sends the Spirit who leads us to the Son who brings us back to the Father. This is what it means to be born of God, born from above, born of the Spirit. The Father is our Father. The Son is our Brother. The Spirit is our Guardian, Guide, and Friend. We are caught up in a mystery that defies our reason and our senses just as Nicodemus was. Father, Son, and Holy Spirit. This is the name you are baptized into, the name that is placed upon you, and the name that gives you a new birth from above.